Ice Dams, How does it affect your home? Ice dams are a common problem in the winter. I is caused by poor attic insulationresulting in a warm attic space. Left untreated, ice dams can cause serious damage to your roof, gutters, paint, insulation, drywall, structure and even contribute to mold. Ice dams form when melting snow on a roof runs off and refreezes at the edge of a roof. This condition occurs when a warm roof, creating water running between the snow and the warm roof surface, melts the snow. The roof becomes warm when heat from the inside of your house escapes into the attic. Then freezing accord turning into ice when it gets past the exterior wall and hits a cold unheated roof edge or gutter. As the bottom of the snow pack continues to melt, water continues to flow down the roof surface until it hits the ice, thereby creating a larger and larger ice dam. Ironically, ice dams occur most commonly after a heavy snow because snow is a great insulator. Ice dam is corrected by increasing the attic insulation eg. R50 or 18” or more if space permits thus preventing heat from escaping into the attic. Note that it is also important to clean or upgrade the eavestrough/gutter so as to prevent ice buildup. 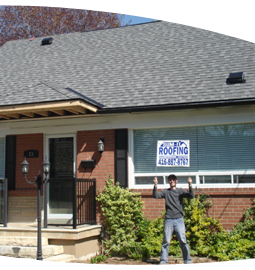 Note that Ice dam can result in water leakage into a roof even if there is underlayment and the roof shingles are new! Yes! We do provide roof top snow removal service.